Border Pinyon Pine is a member of the Pine Family. It is a small to medium size tree that grows from 15-35 feet in height and 20 inches in diameter. It has grey-brown bark that is thin and scaly at the base of the trunk. 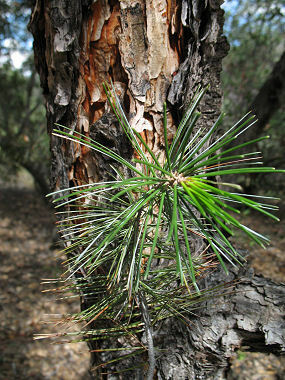 Needles grow in groups of three to four and are deep green to blue-green in color. The tree produces cones to 1.5 inches in length, the seeds of which supply an important food source for jays. The tree grows in southeast Arizona in cool, dry areas at elevations between 5300-9800 feet. The Border Pinyon Pine is very similar to the Mexican Pinyon, but was identified as a distinct species in 1968. Pinyons were used extensively by Indians throughout the Southwest. The nuts were gathered and eaten raw or roasted. Sometimes the roasted seeds were mixed with the pulp of yucca fruits to make pudding.